Introduce a hint of wonderment into your blog with our latest free theme! This is your invitation to take an enchanting voyage to a Strange Little Town. Our latest release is designed to transport your readers to a magical place where imagination fills the air. Nestled below a star-studded sky you will find a cluster of crooked little houses covered in a blanket of fog. Some dwellings appear to have minds of their own while others defy the laws of gravity! Strange Little Town provides multiple options for customization including the ability to add custom header image, change the background color and customize the links in the menu. You can also choose to enable a sidebar by adding widgets under Appearance → Widgets. You can read about all these features and more in the Theme Showcase page. 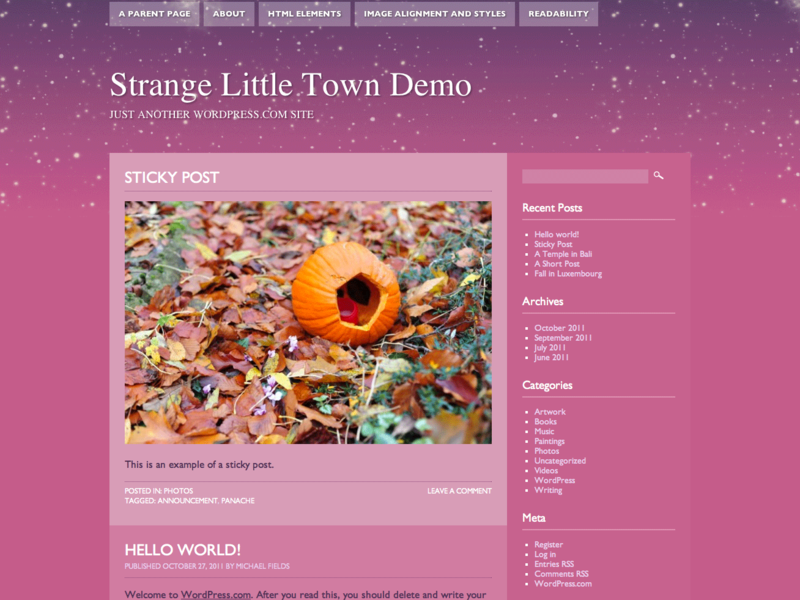 Strange Little Town is available now in your dashboard under Appearance → Themes. Why did this comes out after halloween? lolz! Oh wellz its pretty! Awesome! I might have to try this out….. Very pretty theme but…wait… spooky theme comes out the day AFTER Halloween? Very surreal. I’d love to see how people use it for their posts! That could be my new theme for 2012…LIKE! Is very nice, 😛 i like like … good job. I’m sure this will be perfect for someone. There’s something I really like about the way this theme fits together and its simplicity, but not the pink nor the spooky little town! I would miss the bottom widgets too. Love the style and color – is there a little romantic town on the horizon? Great Job!!! I like the color very much. I love it! What an inspiring, imaginative, playful design;it’s like you entered my dream mind. I’m excited enough to start writing my blog again! I love this,especially the lowest part. It looks so magical. It is amazing, beautiful and colourful, let me try like you. Was it there before.. I thought of having already tried it before. Just marvelous,would love to use it. p.s can you publish new themes more often? i mean per 3 days or this is something difficult? Wow that look very cool! Wow, another amazing theme! I think I’m going to have to plan ahead for next year–this theme is absolutely perfect for all Halloween spirit. This is awesome theme. I love it although it does not suite for my website purpose. Thanks for this fun theme with a whimsical background that can be changed and lots of customizable features including Tables. How cool is that? More for the ladies i guess, nonetheless, it looks attractive! This is interesting, I love it. It’s colourful. Beautiful, in fact, delicious. And the easy-to-find comments section is brilliant. Nice but too pink in the text area. How about something like this with more subtle color options and a less ‘spooky’ city skyline. It would have more potential. Looks nice and clean. But why did the special spooky town come out after halloween? Haha, either way I love that I have multiple themes to choose from now. Thank you! it’s an interesting, good, funny one. like it! This is great. Love to see more of what you have to offer … thanks. Its so fresh like spring! That’s cool. I’d love to try it. I Love it! Great job! For some people “Halloween” themed things are everyday. As for this theme, I adore it! Thanks for creating it. I like the colours. It is comfortable to the eye. me too, i like it so much!!! Gets the prize for “Best Theme Name”. This is a nice one. Shoot I just found about this now! Perhaps I’ll use it next Halloween. Very cute theme 🙂 good job! Nice Theme. It is great! Wow I love it, thanks for the free theme. I love the artwork. Reminds me of those late night cartoon network shows that feature ghost towns. It is very beautiful but there are no theme options so unless you buy a custom design upgrade you can’t change the footer. Seems odd to limit it to just Halloween theme. Am I the only one who feels this way? Hi Shane! Thanks for your feedback about the footer image. It is possible to use your own custom background image or color by navigating to Appearance → Background and adjusting the settings. Lots of new themes lately … they’re, unfortunately, kind of mediocre. I don’t mean for that to sound mean, by the way. Some of them I’d use … now I should go and hide. Sorry this theme didn’t make the cut for you but we’re continuing to launch more and more themes. I hope we can find the perfect theme for you. And if you have any ideas for themes you’d like to see on WordPress.com we’d love to hear them in our themes forum. I love the transparent page buttons. I really love the theme.